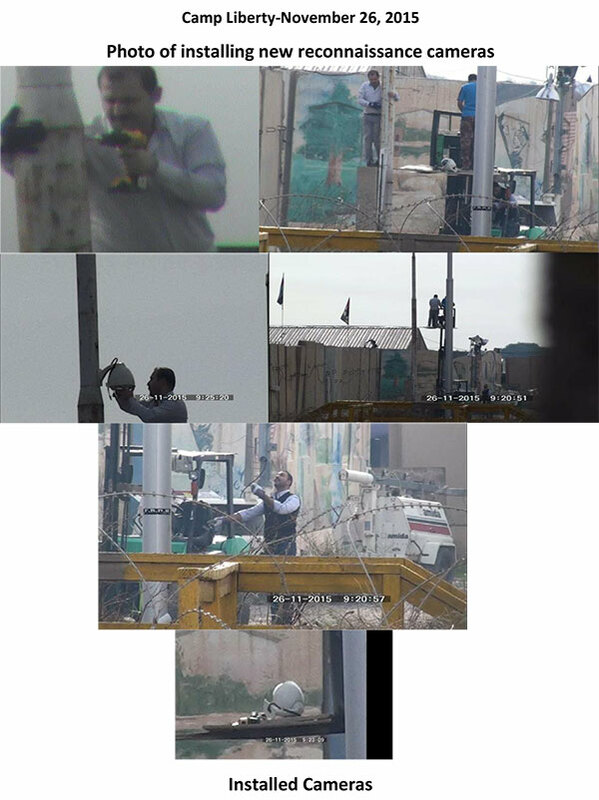 On Thursday, 26 November 2015, agents of the Governmental Committee tasked to suppress Camp Liberty residents headed by Faleh Fayyaz, Iraq’s National Security Advisor, installed new cameras around the place of residence of Liberty residents. The purpose for theses cameras whose output will be passed on to the Iranian regime embassy in Baghdad and the terrorist Qods Force is for more accurate reconnaissance of the camp and the movement of residents in order to inflict more casualties in future missile attacks. After the last deadly attack, the antihuman regime was looking to collect information on the hit locations of the missiles, the names of the wounded, and the destroyed facilities. The installation of new cameras is while a month after the deadly missile attack, the Iraqi forces prevent entry of the necessary construction machinery into the camp to clean up the destroyed trailers and the debris and they obstruct entry of basic items needed to repair the trailers and other facilities or the minimum security requirements such as T-walls. In addition to the destruction of a large number of trailers, many other trailers and facilities have been badly damaged and require repair; otherwise they will not be usable in the cold and rainy season. The Iranian Resistance reminds the repeated and written commitments made by the United Nations and the United States to the safety and security of Camp Liberty residents and warns about the installation of these cameras and machinations by the regime and its proxies in the Iraqi government. It calls for urgent action by the United States and the United Nations for the removal of the cameras and to ensure the security of the residents.